This lesson will teach you how to use a custom content type. 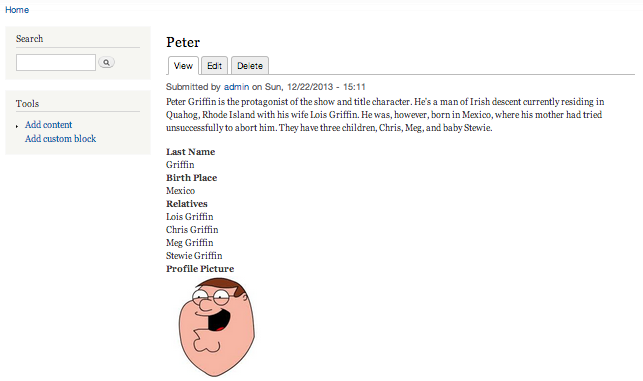 The Family Guy Character content type that was created in the previous lesson will be used for this lesson. 1. Navigate to Admin > Content and select "add content". 2. Select "Family Guy Character". 3. Fill in the form using the information below as a reference. Bio: Peter Griffin is the protagonist of the show and title character. He's a man of Irish descent currently residing in Quahog, Rhode Island with his wife Lois Griffin. He was, however, born in Mexico, where his mother had tried unsuccessfully to abort him. They have three children, Chris, Meg, and baby Stewie. You have just added content from a custom content type to your Drupal site!